Huge thanks to my friends from Penguin Random House for sending me an ARC of this book in exchange for an honest review and for allowing me to host a local blog tour. This did not, in any way, affect my overall opinion of the book and/or the story. I’ve never been the type of person to finish a crossword puzzle. I mean, I like the challenge, as well as the way that it definitely exercises my brain cells, but I just find it too confusing sometimes, and I’ve never actually finished one before. That’s something I have in common with Down and Across’ male lead, Scott Ferdowsi. And I’m so glad to be given the chance to read and promote Arvin Ahmadi’s debut novel today. Read on for a detailed review of this charming novel. Arvin Ahmadi breathed life into a coming-of-age story about passion, growth, grit, and self-discovery, and I adored every single page of it. These are some of my favorite themes to read about, and so if I’m being completely honest, with all its charm and glory, I personally deem Down and Across as a contemporary that’s worthy of being read, loved, and recommended to others. I started reading this while hoping to be moved by Scott’s narration and be entertained by his wit, and that’s exactly what I surprisingly got, and nothing less. It wowed me in a way that I’ve never been wowed by other contemporary novels before, and I think that’s pretty impressionable, especially for a debut novel. Scott Ferdowsi is generally a one-of-a-kind kid. At some point, he resembles each and every young adult there is: excited and enthusiastic, but also afraid and nervous. He’s excited to take on new challenges that life throws at him, enthusiastic to start new passions like writing a novel, and whatnot. At the same time, though, there are days when he feels afraid to follow through with his plans, and nervous to disappoint his family, and / or his loved ones. You have to admit, there was once a time that YOU felt the same way. I know I did. And this is what made me love Scott—the way I related to his attributes, to the point of seeing myself in the way he’s terrified of the possibility of letting his parents down. I’ve felt this quite often, and I’m afraid I haven’t gotten over it, and so this proves that Scott’s struggles are timely and relevant. The writing style with which this story was written is also entirely pleasing, and a lot of readers who are looking to be amused can pick this book up with confidence knowing that they’re in for quite a unique reading experience. There might have been lots of conflicts and drama going on inside Scott’s head, but that can’t overshadow the fact that his voice and narration kept me solely entertained all throughout the story. After turning the last page, not only was I moved by the story, but I also found myself missing Scott’s voice. That was when I realized that Arvin’s debut hooked me so badly that I can’t help but make room in my heart that’s meant solely for Down and Across. JM: Hi Arvin! It’s so wonderful to have you on Book Freak Revelations today! Thank you for wanting to answer some of my questions. Let’s get started! Okay, so for those who don’t know yet, what’s your inspiration for wanting to tell Scott Ferdowsi’s story? Where did the idea for this novel come from? Arvin: My senior year of college, I watched a TED talk by Angela Duckworth, the MacArthur Grant “genius,” where she says the number one indicator of success isn’t your IQ or socioeconomic status, but grit—the ability to persist and overcome failure. It got me thinking about failure and grit. Can a person who constantly fails, who has a track record of giving up, be gritty? I’d switched my college major seven times and still wasn’t sure about my path. I didn’t have a 10-year plan. Two personal failures then came to mind. When I was 10 years old, I started writing a novel and emailed the first three chapters to literary agents. All of them rejected or ghosted me, so I gave up. And when I was 16 years old, I tried “running away” from home. I can’t even remember what I was arguing about with my parents that time. But I wound up in Washington, DC, and hung around until it got dark. At that point it occurred to me that I didn’t have much money or a place to sleep, so I called my parents from a payphone and they picked me up. I thought back to those failures and decided I wanted to pick up where I left off. I started writing the story of a teenage boy who runs away to get gritty, and I told myself I had to finish it. And I did. JM: How did you write Down and Across? How was it for you, writing a YA contemporary novel while having to incorporate a social theme that’s close to the hearts of teens? Arvin: I was persistent, for sure. How ironic would it have been to give up on writing a book about a kid who constantly gives up? It was therapeutic for me to go back to all my insecurities at that age—about my identity, my future, my parents, my friends—and incorporate them into a Ferris Bueller-esque adventure. JM: In writing your debut, did the characters come to you first, or was the plot line the first thing that inspired you to write this story? Arvin: Characters, definitely. Scott is like me in a lot of ways—his Iranian background and his struggle with grit, most of all. The specific plot points and conflicts and other characters came later. JM: How many times did you send a draft of this book, and are there lots of deleted scenes that, unfortunately, didn’t make the final cut? Do you mind sharing one that’s most memorable for you? Arvin: There aren’t as many deleted scenes as there are deleted thoughts, tangents, side-notes, conversation snippets, themes, etc. I wrote the first draft for Down and Across in a very stream-of-consciousness sort of way. All together, I think I scrapped around 50 pages completely. And of course there were many rounds of revision! JM: While drafting Down and Across, did you encounter getting writer’s block? How did you overcome it? Arvin: Surprisingly, no. I was writing on nights and weekends while working a day job, so it was my perfect escape. Since it’s so rooted in my personal experiences, it felt pretty cathartic putting this story on the page. JM: Have you imagined writing your book in a different way? Did you plan writing other ending/s to the story? Arvin: Down and Across isn’t just my debut novel; it’s my first ever attempt at a full novel. So when I go back and read it, I see plenty of things I think I could have done differently. But I firmly believe it’s the most authentic version of this story I could have written. Let me add that just because it was my first “attempt” doesn’t mean I didn’t revise the hell out of it. I think I revised this book fourteen or fifteen times. From my perspective, there are two ways to get to your debut: you can keep writing book after book. Pass them around, take rejections, work on the next one. Or if you really believe in a project, you can stick with it and reinvent as needed. If you’re gritty, you’ll get published. It might be book one or book twelve. It might be draft one or draft fifteen. But it’ll happen. JM: This next set of questions are a little more personal and it focuses more about you outside of your writing processes. If you weren’t an author, what other career tracks do you imagine yourself undertaking? Arvin: Tech! I actually loved that world and think about ways I can get involved again. I get Silicon Valley FOMO all the time. One obvious way I’m getting my fix is with my next book. I can’t reveal the title, but I can say that it’s a near-futuristic story about a girl who enters a virtual reality contest and ends up going viral. It’s set in a boarding school for brilliant kids in Palo Alto, and it’s dramatic AF. At some point I’ll jump back into startups again more directly. But writing is going well for now, and if there’s one lesson I learned from Scott, it’s to follow the momentum in your life. Arvin: Oh man. Where do I begin? Khaled Hosseini for his incredible books that are stories first, in the truest sense, and diverse second. Adam Silvera for his relentless authenticity. The Disreputable History of Frankie Landau Banks by E. Lockhart for being the perfect boarding school book. The Hate U Give by Angie Thomas for its perfect first chapter. JM: If given the chance to visit anywhere in the world, either for vacation, or just to gather inspiration for a new book, where would you go and why? Arvin: I traveled to twelve countries in Europe while I was writing my second novel. When I got back to the US, I printed and read everything that I wrote. And there were two or three chapters that stood out from the rest. I realized I had written those chapters while I was in Italy—there’s something about the stunning piazzas, the ancient cafes, the atmosphere and culture and food of that country that just inspires creativity. I’ll definitely be back. Arvin: I love dogs, but sadly, I’ve never had one. My mom is absolutely terrified of them, so we weren’t allowed to get a dog growing up. I did have a beta fish my freshman year of college, but he ran away. I’m not kidding. I left his tank by the kitchen sink one afternoon, and when I came back, he was gone. JM: For those who follow you on your author adventures on social media, they’d know that you’re already working on your next book. If you could define it in just 6 words, what would they be? Immigrants. Failure. Secrets. The American Dream. JM: (We’re down to the last part of the interview!) Do you have any advice for aspiring writers all over the world? Mind sharing any tips that can make them feel motivated? Arvin: I have two pieces of advice for aspiring writers. The first piece of advice is to read widely, and to study what you read. I try to read a solid mix of fiction and nonfiction, and I’m a much slower reader these days than I was as a kid. That’s because I didn’t formally study writing, and so I look to books to teach me about structure, exposition, plot, tension, conflict, character development, and more. My second piece of advice is to be gritty. That doesn’t mean you have to finish every book you’re reading or every story you start writing. But think twice before giving up. Especially if you really believe in a project, it’s worth it to power through the writers’ block and the tough times. Arvin: I sincerely hope you enjoy Down and Across, and I hope you take something away from Scott’s journey. And best of luck on your own journey! 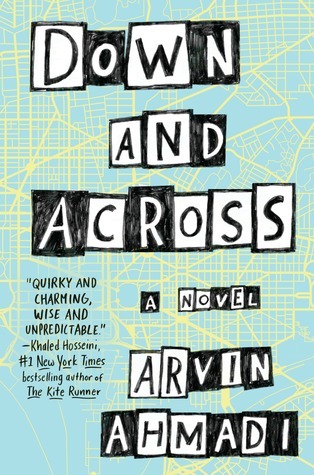 Up for grabs is an ARC copy of Arvin Ahmadi’s Down and Across sponsored by Penguin Random House International! All you have to do is check out this Rafflecopter link and follow all the steps to enter. Have YOU read Down and Across yet? If not, be sure to check out once it’s out on February 6th! And once you do, let me know what you think of it down below in the comments section! JM is a 21 year old blogger from Manila. He has a degree in Hotel and Restaurant Managment mainly because it was too late when he discovered that literature and publishing is his true calling. He enjoys reading contemporary and fantasy novels as much as he enjoys playing video games and baking pastries. You may find him on Twitter, Instagram, and on Goodreads. Poetry Collections I’ve Been Reading (and Loving) Lately! Ahhh I cannot wait to read this! Great review! I have been reading more reviews and everyone says this book is gritty, important and diverse. I’m so happy to have found a must read book for me this year.